During Valentine’s Day in Branson, there are thousands of vacationers flocking to the Ozarks to experience a romantic getaway this season. This great vacation destination in the Ozarks is a perfect place for couples who want to spend a romantic escapade in a calm environment where you can have the chance to see fascinating vistas and stunning views. 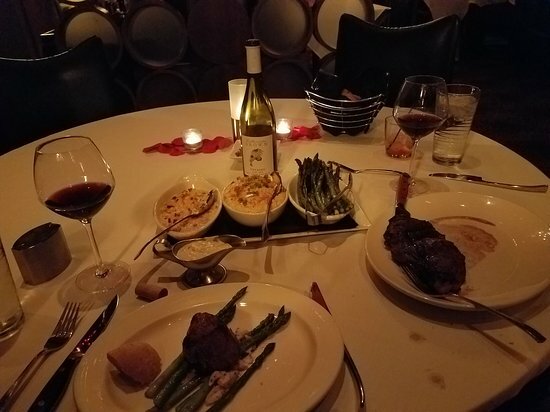 A wonderful Valentine’s Day with your loved one can be enjoyed best if you visit some of the top 5 romantic places in Branson such as Level 2 Steakhouse, Landry’s Seafood House, White River Fish House, Cantina Ladero, and Chateau Grille at Chateau on the Lake. Beautifully located at the Hilton Branson Convention Center Hotel, Level 2 Steakhouse is a perfect dining spot for romantic couples who are looking for outstanding steaks. In this restaurant, you can experience world class service, an extensive wine list, signature cocktails and the best food in Branson. This top quality steakhouse in Branson features Kansas City 28 day aged Certified Hereford Beef and the Midwest’s freshest seafood flown in twice weekly from around the world. The beef in this restaurant is prepared in a 1600 degree radiant oven, sealing in the juices, while creating the perfect steak. Other great features of the restaurant include extensive list of sides, such as egg noodles and cheese, house cut sweet onion rings, steamed asparagus and creamed spinach that are large enough to feed two. The chef has brought to this place a whole new level of the Midwest’s beloved cake. Once you taste it, you’re sure to be hooked with it. There are countless options to consider inside the Hilton Branson Convention Center, at Level 2 you’ll find a setting that’s just right for your night out for two. Known for awesome steaks, the menu at Level 2 offers something for every taste. Nestled in the heart of all the fun and exciting attractions that Branson has to offer, you’ll find Landry’s Seafood restaurant, such a great place to enjoy a romantic escapade with your loved one. This restaurant has brought the great taste of the Gulf Coast to one of the nation’s premiere entertainment destinations. Conveniently located near some of Branson’s most unique attractions and hotels, Landry’s Seafood restaurant has developed a good reputation to their customers for serving fresh seafood, succulent steaks and delectable desserts with indoor and patio seating. Landry’s Seafood House is a perfect place to bring your significant other to experience awesome Valentine’s Day in Branson. This is another beautiful restaurant that offers not just delicious seafood but also fantastic atmosphere and nice view of the surroundings. This eclectic seafood restaurant features a huge variety of delicious seafood that includes Red Snapper, Shrimp, Catfish, Crawfish, Salmon, Crab, Flounder, and Tuna. If you are not in the mood of eating seafood, this fascinating dining venue also serves grilled steak. If you are looking for the best seafood restaurant in Branson, Landry’s Seafood House is the place. The diverse menu of the restaurant encompasses the freshest seasonal fish, seafood, steak, and pasta specialties. This nice dining place also offers an extensive wine list, vegetarian options, a gluten free menu, and kids menu in every location. Landry’s Seafood House strives to serve its customers the best seafood in town and provide a fun-filled dining experience that will make you think of coming back the next time you visit Branson. Beautifully located at 5 Bass Pro Drive in Branson, White River Fish House will make you feel an intimate escapade with your loved one as you enjoy a fascinating dining experience in this floating restaurant. Owned by the world-famous outdoor outfitter, Bass Pro Shop, this dining establishment has become a unique dining venue after a barge was converted to become a unique floating restaurant. The restaurant offers a fascinating dining experience in Branson completed by the relaxing atmosphere and picturesque views of the surroundings, beautiful scenery, and wildlife at the foothills of the Ozark mountains. 417 Magazine named White River Fish House as the “Best Restaurants in Branson”. This scenic restaurant in Branson offers not only delicious food, but a beautiful ambiance and great view of Lake Taneycomo it brings. Menu served in this restaurant is a favourite for everyone which always has a wide list of delicious food from pastas to catfish. This floating restaurant serves local dishes to shoppers and fishermen alike. Whether you arrive by boat or by car, you will certainly enjoy the wide selections of menu served in this popular eatery. This elegant restaurant has a seating capacity of 300 in the main dining area. Cantina Laredo is another romantic restaurant in Branson where you can indulge with your loved one authentic Mexican cuisine. When you dine at Cantina Laredo with your special someone, you will truly be satisfied with the authentic taste of Mexican food. Some of the delicious food at Cantina Laredo include the Top Shelf Guacamole which is served fresh at your table; Ahi Tuna tacos (mini-crispy tacos with sushi cut ahi tuna, jicama slaw and guacamole, and chipothe aioli); Quesadillas Al Carbon; Nachos Al Carbon with choice of Chicken Fajita or Beef Fajita; and Queso Laredo (queso with taco meat and pico de gallo). Guests will always be served with free chips and salsa. Cantina Laredo is the only Mexican restaurant in Branson that serves hot salsas in temperature hot. Although some diners find it great to enjoy cold salsa. In this restaurant, you don’t only enjoy their authentic Mexican cuisine, you also enjoy a panoramic view and the beautiful scenery around the lake. When the weather is nice, it is great to be seated on the patio giving you the opportunity to watch a spectacular fountain show and see strollers roaming around the promenade of Branson Landing. The food served at Cantina Laredo is outstanding and always features authentic Mexican cooking. Menus featured in this Mexican restaurant usually include a tamal, enchilada, burrito and carne asada tacos with rice and beans. The tamal and carne asada is really yummy and very authentic. Visitors who have tried a satisfying dining experience in Cantina Laredo will definitely go back for more. This restaurant is a great dining spot for diners who prefer gluten free queso and guacamole. You will surely be impressed when the fresh guacamole is prepared right in front of you. The Chateau Grille at Chateau on the Lake is another great dining spot to celebrate Valentine’s Day in Branson with your loved one. 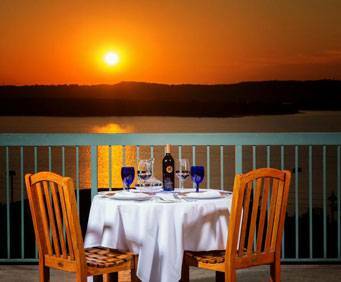 In this great dining venue, you can have the chance to watch a picturesque sunset over Table Rock Lake as you enjoy an intimate dinner with your special someone in this award-winning restaurant. Here you’ll enjoy modern American flavours that the culinary team of Chateau on the Lake have created with a fresh, unique modern twist. The menu is created with local flavours of Missouri, using only the freshest ingredients and always with a sustainable friendly approach. A favorite among locals, Chateau Grille is beautifully located inside Chateau on the Lake resort that offers panoramic view of Table Rock Lake. While you are indulging with the restaurant’s great food and amazing wine selections, you are insured by the service staff that your every need is met to give you a memorable dining experience at Chateau Grille. If you are looking for a place to spend a wonderful Valentine’s day in Branson with your loved one, be sure to check out the 5 romantic places in Branson.